Posted on November 1, 2018 at 9:42 am. 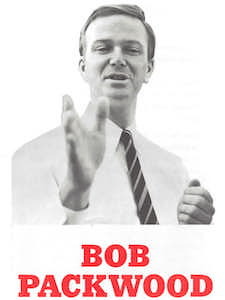 The Robert W. “Bob” Packwood papers comprise the records of the Dorchester Conference started by then-Oregon state representative Robert Packwood, legislative material generated and received by Packwood’s office during his five terms as a United States Senator from Oregon, material related to his campaigns, press and public relations material, personal/political files, and autobiographical writings. Bob Packwood was born in Portland, Oregon in 1932. He attended Grant High School in Portland and graduated from Willamette University in 1954 with a degree in political science. As an undergraduate, he served as an officer in the Young Republicans Club and worked on Mark O. Hatfield’s successful bid for the Oregon legislature. After graduation, Packwood was awarded a prestigious Root-Tilden Scholarship to attend New York University Law School. As a law student, he won a first-round national moot court competition and was elected student body president. In 1957, Packwood worked as a law clerk for Oregon Supreme Court Chief Justice Harold Warner in Salem, and subsequently found work in 1958 with Portland law firm Koerner, Young, McColloch and Dezendorf. He became a Republican precinct committeeman in 1959 and was named Republican Party Chairman of Multnomah County the following year. At the age of thirty-one, Packwood successfully ran for the Oregon legislature, becoming the state’s youngest legislator when he began his term as a state representative from Portland in January 1963. The following year, Representative Packwood gained political notoriety by working with business groups and party leaders to successfully recruit, train, and coordinate GOP candidates for the state legislature in the 1964 general election. His strategy allowed the Oregon House to become the only legislative chamber in the country to switch to GOP control that year, despite a landslide election for Democrats across the nation. As chair of the House Local Government and Elections Committee, Packwood worked to create single-member districts in Oregon, a measure adopted after he left the state legislature in 1967. In 1965, Packwood founded the Dorchester Conference, a state-wide meeting of Republican politicians and activists on the coast in Lincoln City, Oregon, with the goal of mobilizing and energizing moderate Republicans within the Oregon Republican Party. In 1968, Packwood won the Republican nomination in Oregon to run against four-time incumbent U.S. Senator Wayne Morse. In a close race, Packwood defeated Morse, becoming the youngest member of the U.S. Senate at age thirty-six. Packwood’s early legislative efforts include introducing the Senate’s first national (pro)-abortion legislation, advocating to abolish the seniority system within the U.S. Senate and the championing of successful environmental conservation efforts in Oregon. His environmental achievements culminated in the passage of legislation to preserve Cascade Head (1973), Hells Canyon (1975), French Pete (1978) and the Columbia Gorge (1985) in Oregon. Packwood served as chairman of the National Republican Senatorial Committee, the campaign arm of the Senate (1977-1979; 1981-1983), where he skillfully worked to increase the fundraising capacity of the GOP, aiding the election victories of several GOP Senators during the late 1970’s and early 1980’s. During the Presidency of Ronald Reagan, Packwood chaired both the Commerce Committee (1981-1985) and Finance Committee (1985-1987). As a member and chair of the Commerce Committee, he successfully passed legislation to deregulate several industries, including airline, trucking, railroad, and telecommunications. As chairman of the Senate Finance Committee, Packwood was instrumental in proposing and guiding a bipartisan effort to pass the 1986 Tax Reform Act. For more information about the Packwood papers and access to this collection, please see the finding aid.